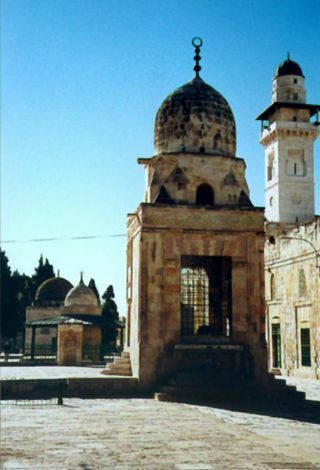 The Haram Ash-Sharif, or Noble Sanctuary, occupies an artificially levelled and flagged plaza atop Mount Moriah. The plaza was part of a grandiose undertaking of Herod the Great, but the temple which he built here, on a site used a thousand years earlier by Solomon, was destroyed by the Romans a century later. 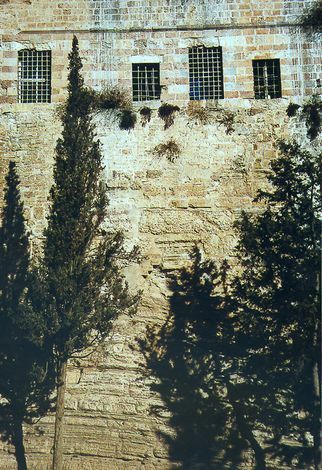 Until the arrival of Jerusalem's Muslim conquerers, hundreds of years later, the site was a ruin. The most important buildings on the site today are the Dome of the Rock and the Al-Aqsa ("the farthest"--from Mecca) Mosque. The Dome of the Rock was begun in 687 by the Umayyad Caliph Abdel Malik. Mecca at the time was inaccessible because of a rival caliph, and Abdel Malik needed an alternative pilgrimage center. He chose Jerusalem, then dominated by Christian monuments. Specifically, he chose the rock where Abraham is supposed to have prepared to sacrifice Isaac. In the center of the building is the massive knob of that rock, which Muslims circumambulate just as they do the Black Stone at Mecca. Enclosing it are two profusely decorated concentric colonnades--an inner circular one, which supports the dome, and an outer octagonal one, midway between the dome and the outside wall. 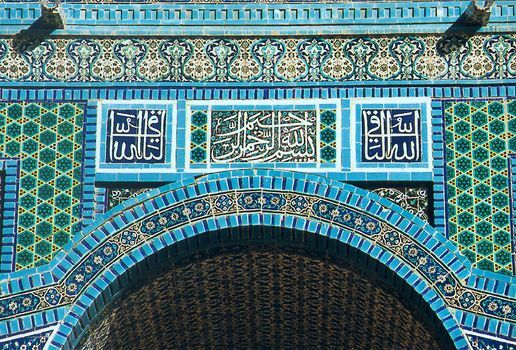 The octagonal exterior was originally covered in mosaic, but since the time of Suleiman the Magnificent (d. 1566) it has been tiled and re-tiled, most recently about 1960, when Jerusalem belonged to Jordan. The view here is from the public entrance, which is on the south side. 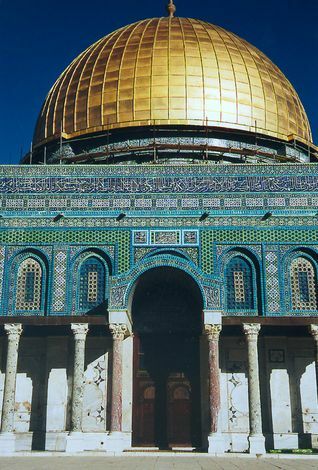 (Perhaps the best photographic record of the building--inside and out-- is Oleg Grabar and Said Nuseibeh's The Dome of the Rock, 1996). The almost unvisited north end of the Haram abuts against a wall atop which now stands a 14th century Koranic school. Old as it is, the school sits atop the rough stones of an older wall, the only remnant of the Antonia Fortress, built by Herod to protect the nearby temple and named to honor Mark Antony. Seized by rebels a century later, the fortress was levelled by the Romans, save for these remaining stones of its south wall. 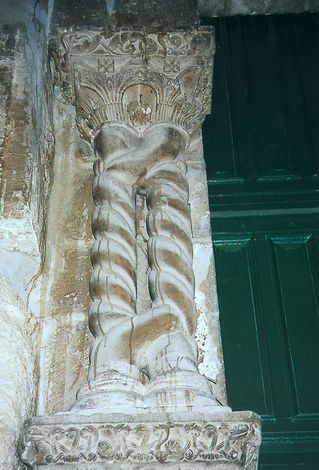 The light-colored and near-square indentation just to the right of the tree trunk once held a roof beam of a high portico built by Herod and running around the perimeter of the Temple Mount. 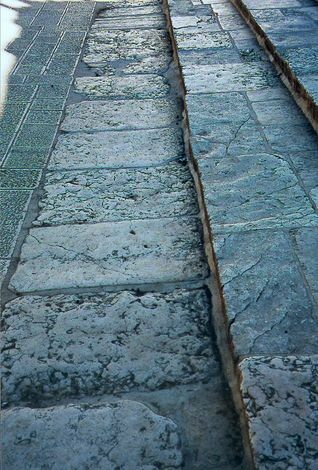 The great temple built by Herod was destroyed by the Romans in the second century except, perhaps, for this line of stones, which are much larger than the other paving stones of the Haram and which appear to mark the northwest corner of Herod's temple platform. 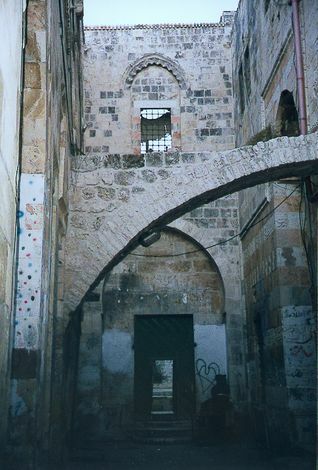 The Bab el-Atm, one of the Haram's less grand entrances. Non-Muslims may exit the Haram through it but not enter, and between this restriction and the gate's architectural modesty, the Bab Al-Atm is a reminder of the Haram as a quietly spiritual place, not a thicket of monuments and cameras. Several freestanding structures surround the Dome of the Rock. Among them is this 15th century sabil ot public fountain of Sultan Qaytbay. Islamic design, local craftsmen? Not quite. The fountain was built by Egyptian workers under the direction of a Christian mason. Intertwined columns flanking the Bab al-Hadid, a gate on the west side of the Haram--but one that only Muslims may use to enter the Haram. Security is tight, from both the Israeli and Palestinian sides.